Earlier this week we were approached by a performing group who was going to use Romeo and Juliet for the first time with their young audience. They were concerned with how to tell the end of the story without being too disturbing or too blase – getting the lesson across without traumatizing their audience. We’ve been giving the tragedies to elementary-aged kids for a good long while, but it was still an interesting question to ponder. Lucretia Anderson put in her two cents: “They were desperate teens who did something awful to themselves resulting in a huge tragic loss for both families. This should teach students that coming together and eradicating hate is the way to go. We usually say that they “took their own lives” instead of saying they “committed suicide” or “killed themselves.” Romeo takes poison, Juliet stabs herself with a dagger. The elementary kids can handle it. Ultimately, each teacher or presenter is familiar enough with their own audience of students that they know what they’ll be able to handle. But is there a line to toe, and where is it? The research bug got me again, so I looked at a few examples of books for kids that depicted the lovers’ final acts. Read on for these examples, below, but how do you talk about fictional tragedy in your classroom? Graham Hamilton, Nicole Lowrance, Romeo and Juliet, Folger Theatre, 2005. Here Romeo took his last leave of his lady’s lips, kissing them; and here he shook the burden of his cross stars [sic] from his weary body, swallowing the poison which the apothecary had sold him, whose operation was fatal and real, not like the dissembling potion Juliet had swallowed, the effect of which was now nearly expiring, and she about to awake, to complain that Romeo had not kept his time, or that he had come too soon. …but when Juliet saw the cup closed in her true love’s hands, she guessed that poison had been the cause of his end, and she would have swallowed the dregs if any had been left, and she kissed his still warm lips to try if any poison yet did hang upon them: they [sic] hearing a nearer noise of people coming, she quickly unsheathed a dagger which she wore, and stabbing herself, died by her true Romeo’s side. He knelt beside her and made his sad farewell. “Eyes, look your last. Arms, take your last embrace! And lips, O you the doors of breath, seal with a righteous kiss a dateless bargain to engrossing Death.” Then, with a sudden joyfulness he cried, “Here’s to my love!” and drank the apothecary’s poison; and so, in an instant, ended for ever the parting from his love. Longingly she kissed Romeo’s lips in the hope that some poison still remained on them. There was none; so she took his dagger and pressed it lovingly into her heart. He held her close in a final embrace. And she knelt one last time by her Romeo. “One friendly drop to me you deny? Then fell to the ground by Romeo’s side. Romeo drew the cork from the poison bottle and raised it to his lips. He felt the vile liquid sting his throat. Then darkness swallowed him. For a time, there was no sound except the spluttering of the torch. Then Juliet began to breathe. She opened her eyes and saw Romeo dead at her side with the empty poison bottle in his hand. At first, she thought she was dreaming. But when she reached out to touch Romeo’s face and smelled the bitter scent of the poison, she knew the nightmare was real. Friar Laurence’s plan had gone terribly wrong. She cradled Romeo in her arms and rocked him, weeping into his hair. “If you had only waited a little longer!” she whispered. She kissed Romeo again and again, desperately hoping that there was enough poison on his lips to kill her too. Then she saw the torchlight gleam on the dagger at Romeo’s belt. She drew the weapon and pressed the point to her heart. “Now, dagger, take me to my love!” she said, and pushed with all her strength. Romeo opens Juliet’s tomb. He gazes lovingly at his bride. Romeo then prepares himself to die. He drinks the poison and dies. Just as Juliet wakes up, the Friar arrives. He sees the bodies of Paris and Romeo. He tells Juliet they must fly away at once. When Juliet sees that Romeo is dead, she refuses to leave. She sees that he has taken poison. ‘O, churl! Drink all and left no friendly drop to help me after?’ she says. She kisses his lips. Then she takes up Romeo’s dagger to stab herself. The voices outside grew louder. Juliet drew Romeo’s knife and aimed it at her heart. “Oh happy dagger! This is thy sheath. There rust and let me die.” With a swift motion, she stabbed herself and collapsed beside her husband. I am not a teacher. I dropped my education major my first semester of college, and I have never looked back. And yet, somehow, in the funny way that life seems to happen to us, I ended up scheduled to teach a writing class for 8-10 year-olds at the day camp where I worked as an assistant. What I know is Shakespeare. So day three of the class was dubbed “Literary Flourish Day: Metaphor, Imagery, and Meter.” The day before, I had been trying to explain “showing versus telling” to the students, and these elements are good examples of how to do that. And what better writer to use an example than the master of showing? We started with metaphor, using Romeo’s “O, she doth teach the torches to burn bright./It seems she hangs upon the cheek of night/As a rich jewel in and Ethiop’s ear.” We worked through all the language and figured out what it meant, and we discussed how we knew how beautiful Juliet was to Romeo, without him ever using the word “beautiful.” Then the students drew a picture of Juliet – how they saw Juliet through Romeo’s description of her. Most of them picked up on the image of an earring and had Juliet wearing large hoops; some of them even picked a time period and made “’80s Juliet,” in neon and teased hair. For imagery, we used The Seven Ages of Man, from As You Like It. I wrote each age on a giant notepad, and again, we worked through it and visualized each stage, picking out the characteristics of the age, both physical and emotional. Then each student (luckily, there were 7 that day) picked an age and acted it out. Their favorite image, undeniably, was the infant, “mewling and puking.” They all pretended to mewl and puke for about 10 minutes. Lastly, we tackled rhythm. We talked about rhythm in music, and then we turned to Macbeth, using some of the “Double, double, toil and trouble” rap to show it in literature. Then the students made metrical lists of their favorite things and presented them to the class. I am not a teacher. But being able to show these children how beautiful life can be, on the page and the stage, made me so thankful for the teachers we do have: those with a passion to take the beautiful things we’ve been given and introduce them to the next generation, passing wisdom and the value of aesthetics down through the ages. People hundreds of years ago recognized the value of Shakespeare’s words, the relevancy they carry even to 8-10 year olds, so let’s continue that tradition. Share the lessons you’ve learned from Macbeth and the Henrys, from Cordelia and Miranda. Show them the richness of words, the images they can conjure, and the meaning they can give to life. We can all be teachers. Some people just get paid for it. 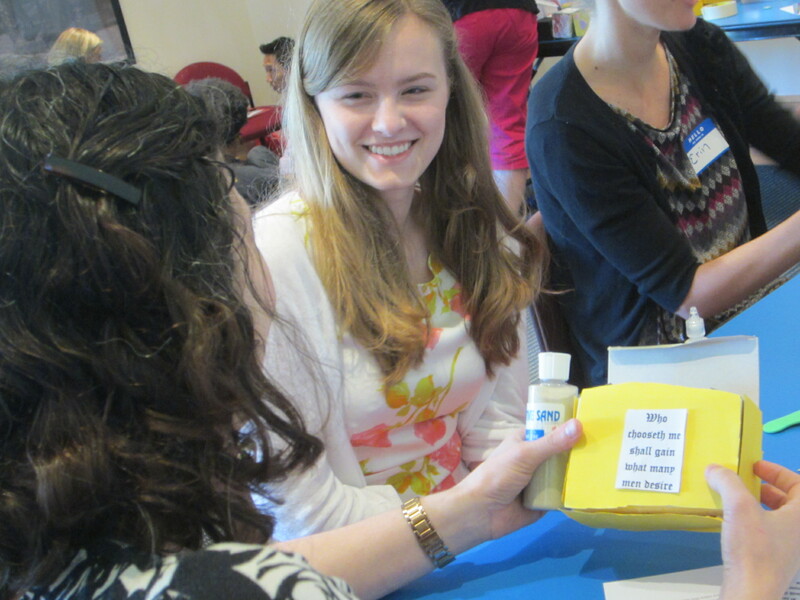 Emily DenBleyker was the spring 2013 Folger Education intern. She is now a senior at Gordon College, completing degrees in music and communications. Her roommates tolerate her rants on the beauty of words, if only because she edits their papers. Some decades ago, the little girl I used to be sat on her bed and listened intently, enthralled by the words that came from her sister’s mouth as she read her homework aloud. “Double, double, toil and trouble…” Listening to the magic of those words ultimately led me to become a writer, a reader, and a teacher. So, when I encounter adults who think Shakespeare is too hard for kids, I am mystified. Wouldn’t the magical words of Shakespeare’s plays and poems capture the imagination of any child if presented in the right way? This year, I tested my theory with my 6th-graders as we read A Midsummer Night’s Dream together. Just as I do when I teach older students, I started out with a bit of “Shakespeare Therapy,” where we hash out our fears and concerns about taking on such a daunting project. I shared my own difficulties with learning foreign languages as a pre-curser to asking my students to wrestle with Shakespeare’s peculiar brand of English. And this time I offered a challenge that would turn out to make all the difference in my students’ motivation to learn: We would create a puppet show for the entire school based on scenes from the play. As we began to read the play in class, using the Folger’s Shakespeare Set Free as a guide, I overheard students muttering comments like “That’s my puppet!” as each character was introduced. Their interest in each character’s development was sparked from the beginning – and my gender-blind assignments even drew in boys who were given Titania or the young female lovers’ characters, for instance. Students “previewed” the play at night (reading for as much understanding as they could muster, but not worrying about getting it all), and we worked out the staging as we read each scene during the day. My students were hooked! Susan’s students perform a scene from MIDSUMMER for the elementary student body. With only a week for rehearsals and some of the puppets not quite finished, we readied ourselves for our performances. I pared the play down to its most puppet-friendly scenes, and then I assigned readers for each part. Like many directors, I’m sure, I doubted it could all come together in time, but the students performed beautifully in front of our K-4 students. The goal of performing live drove them to understand the scenes in ways they might never have done otherwise. Hermia did almost lose her head when her puppeteer rather overzealously jiggled her up and down during her insult contest with Helena, but otherwise we had no other mishaps and the children in the audience laughed and shrieked at all the right times. My students couldn’t have been prouder of their hard work. Their end-of-year reflections often mentioned the puppet show and learning how to read Shakespeare as major accomplishments. 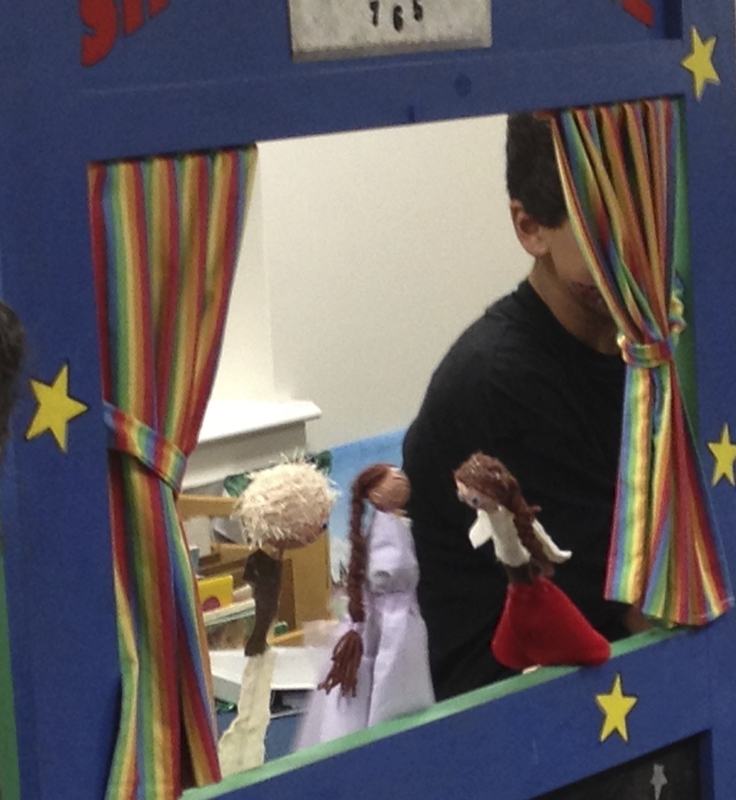 One student wrote, “The puppet show helped me understand Shakespeare a lot more than I did before. When we were being puppets we really had to understand our role. We had to know when our person exited and entered and when they were asleep or awake. I think that really helped me understand because I had to know what was going on the whole time. That really helped me and I think it made me read with a different perspective.” More than anything, my students experienced Shakespeare as something fun and challenging, and I hope something magical they will come back to again and again as they grow up. Susan Lucille Davis teaches 5th and 6th-grade Language Arts at St. Mark’s Episcopal School in Houston, Texas. She has been introducing readers of all ages to the magic of Shakespeare for three decades. She has a Master’s of Fine Arts in Creative Writing from George Mason University and a BA in English from the University of South Carolina. When not teaching Language Arts, she also blogs at The Flying Trapeze and as a featured “Smart Teacher” at Getting Smart. This past weekend I had the privilege of assisting on our 3rd installment of Shakespeare in Action – a family workshop in which parents and their young children (ages 6-12) approach a scene from Shakespeare’s canon in a physical way. In the past we’ve looked at the opening scene from Romeo and Juliet and the climactic finale of Macbeth. This time we focused on parts of Julius Caesar Act 5, Scene 1. The focus is to approach the text seeking what we call “action clues.” What is the text telling us to do when we perform it? How can we best tell the story? 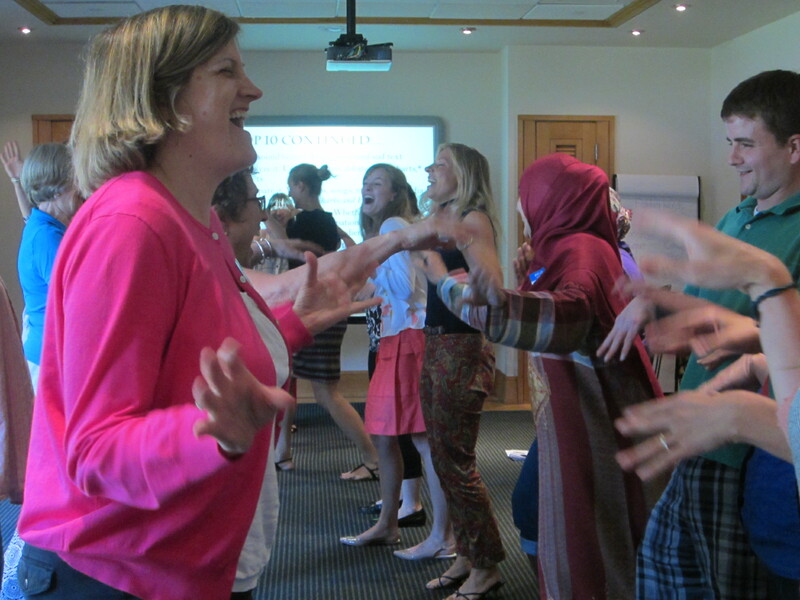 We started by warming everyone up with a couple of theater games to shake our bodies out and get comfortable with the group (we had about 30 guests! ), then we settled down together to read the scene aloud. If there was a word someone didn’t understand or a phrase that seemed confusing, anyone could raise their hand and say “BING!” and we would talk it out together to see if we could use the context clues to figure out what it meant. Once that was done, we split the group into two teams, and alternated rehearsing the scene and learning safe stage combat from our swordsman, Paul Hope. I appreciated especially when Paul asked our group if they’d ever done “Fake-Fighting” on the playground. Many hands were raised. 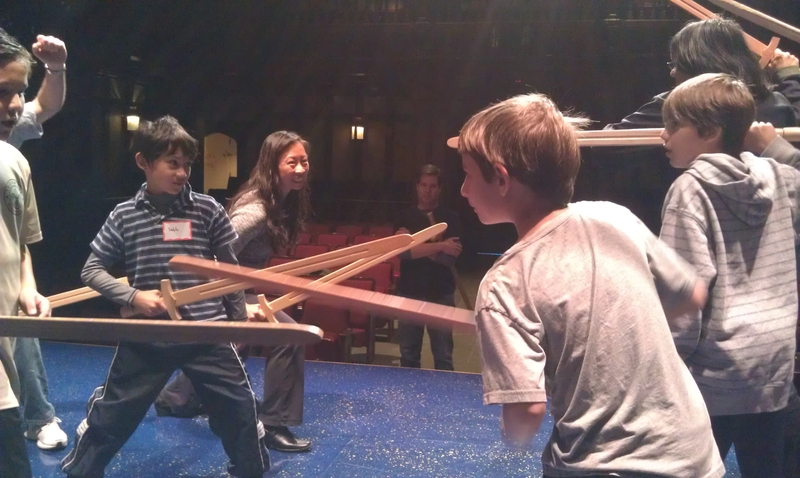 “What’s the difference between Fake-Fighting and Stage Combat? Does anyone know?” The difference is that with Stage Combat we’re using choreography, a pre-determined series of actions that are well-rehearsed and completely safe in order to tell a story. People can get hurt when they Fake-Fight, but in Stage Combat everyone is safe. 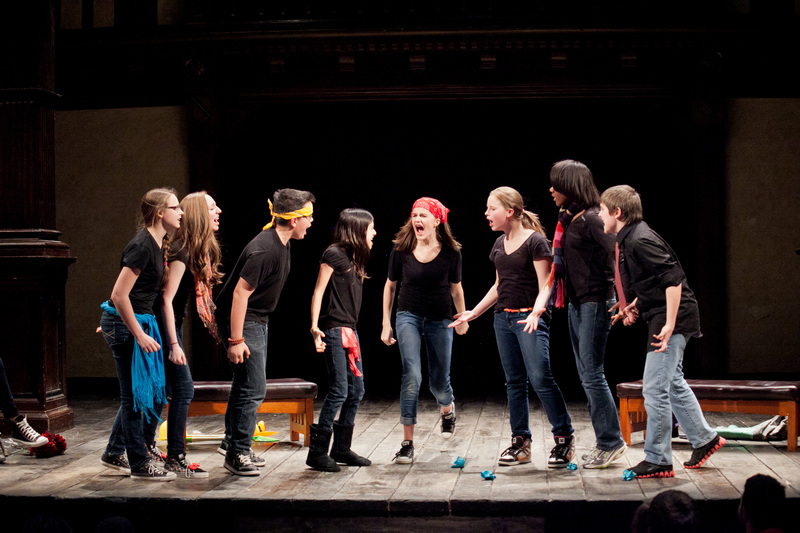 Getting students on their feet to experience Shakespeare’s language is entirely do-able! All you need is one engaging, active scene and a little time. If you’re planning to visit DC this summer with your family, please keep in mind that we offer free hour-long family workshops every First Saturday of the month! Join us to experience Shakespeare’s words in action (sans wooden swords). Or simply visit us any day of the week with your family to see this summer’s three mini-exhibits while we renovate our Great Hall. We’re open every day and there’s always something to see!